Toothache can vary from mild to soreness to an unbearable throbbing pain in the teeth and around the jaws. 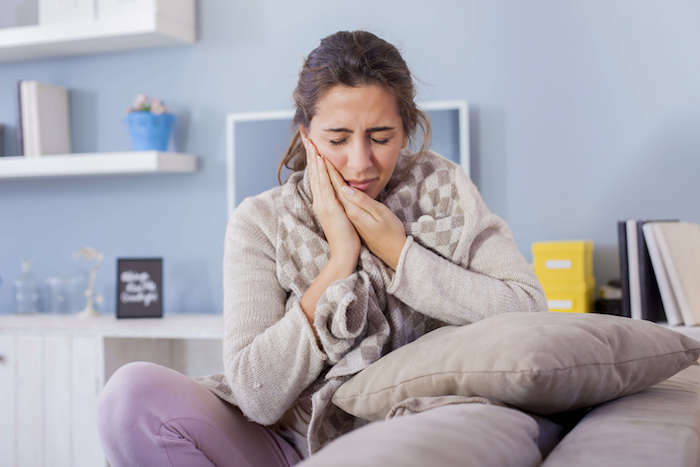 Jaw joint disorder, a loose filling, gum disease, a cracked tooth, an exposed tooth root, an infection and cavities are some of the main causes of toothache. When the pulp (the central region of your tooth) becomes inflamed or irritated, then is happening the toothache. We know that the pulp consists of several nerve endings which are highly sensitive. There are many reasons why the pulp can become irritated or inflamed and some of them we have mentioned previously. If you have noticed that you have toothache, then you should ask for medical help as soon as possible because this problem can get worse. When we have a toothache, then this means something is wrong. It might indicate that we have an infection, cavity, loose filling, gum disease or any other problem in your mouth. Until you fix this problem you need to reduce the pain. Also you can try some of the mentioned home remedies which can give you a temporary relief from the pain. They are available in most kitchens so maybe you will not pay anything. Warm salt water: If you have a toothache, then a simple glass of salt water can help you to treat this condition. In a glass of hot water you should mix half a spoon of common salt and then you should use this natural cure to rinse your mouth thoroughly. This will help you to reduce inflammation and swelling and also it will fight against bacteria which are a cause for the infection. Asafetida: Asafetida is effective home treatment for dental problems such as bleeding gums and toothaches. In two teaspoons of lemon juice you should add a pinch or one half teaspoon of powdered asafetida. Then, you should warm this natural mixture slightly. You should use a cotton pad to apply this natural cure on the affected area. This home remedy will give you a quick relief from the pain. Also asafetida fried in clarified butter can be put in the tooth cavity because this will give you an instant relief. Onion: This vegetable is effective home remedy for toothache. It has antimicrobial and antiseptic properties that can control a toothache. Also it can give you a relief from the pain because it is killing the germs which are cause for the infection. When you have the first sign of a toothache, then you should chew raw onion for a few minutes because this will give you a relief from the pain. If you are not able to chew onion, then you should place a piece of raw onion directly on the bad tooth or gum. Cloves: Cloves have anesthetic, antioxidant, antibacterial and anti – inflammatory properties which can help you to alleviate the tooth pain and they will fight infection. You should grind 2 whole cloves. You should mix in a little olive oil or/and vegetable oil and you apply it on the affected tooth. Also there is another natural treatment which you can use from this home remedy. You should dab a cotton ball in clove oil and you should rub the cotton ball directly on the sore tooth. Also you can mix a few drops in half glass of water and you should use this home remedy as a mouth rinse. Garlic: This is one of the most used vegetables for many different diseases. It can provide you immense relief from the toothache. This vegetable has antibiotic and other medicinal properties which can be used as natural treatment for reducing the pain. You should mix a crushed garlic clove (also you can use a garlic powder) with some table black salt or salt and you should apply this home remedy directly on the affected tooth to alleviate the pain. Also you can chew one or two cloves of garlic to get a relief from the toothache. You should repeat this natural treatment in a period of few days. Pepper and salt: Salt mixed with pepper can be very effective home remedy when your tooth becomes extremely sensitive as both the ingredients have analgesic, anti – inflammatory and antibacterial properties. You should mix equal amounts of common salt and pepper with a few drops of water to form a paste. You should apply this paste directly on your affected tooth and you should allow it to sit for a few minutes. You should do this natural treatment in a period of several days. Vanilla extract: You should use vanilla extract as your natural treatment for treating toothache because it can help you to numb the pain. Also vanilla has calming effects. You should dip a cotton swab in vanilla extract and you should dab it on the affected area. You should do this natural treatment a few times per day until you get a relief from the toothache. Guava leaves: Fresh guava leaves also can be used as natural treatment for alleviating toothache because they have antimicrobial, analgesic and anti – inflammatory properties. You should chew one or two tender guava leaves until the juice from them starts working on the affected tooth. Also you can use raw spinach leaves in the same way. Also there is another home remedy which you can use for the treatment of toothache. You should put 4 – 5 guava leaves in water and then you should boil them. You should allow this home remedy to cool to a warm temperature and then you should some amount of salt. You should use this home remedy as a mouthwash. Ice cubes: Ice can help alleviate tooth pain by numbing the nerve endings. You should wrap a small ice cube in a thin cloth and you should hold it on your cheek near the aching tooth in a period of a few minutes. You should know that if you have exposed nerves, then the contact with cold can cause you more pain. Also there is one an acupuncture technique which you can use to ease the tooth pain. You should rub an ice cube between your thumb and index finger in a period of few minutes. Wheatgrass juice: This natural cure has antibacterial properties which can help you to fight tooth decay and get a relief from the toothache. You should extract the juice of wheatgrass and then you should use this juice as your mouthwash. This home remedy will absorb toxins from your gums, reduce the growth of bacteria and also it will keep the infection under control. Turmeric: This is one of the most used natural treatments for toothache. It has antibacterial, analgesic and antiseptic properties which can help you to stop the pain. Also this natural cure can be used as natural cure for gum infections and tooth infections as well as excruciating abscess. In a small amount of water you should add a teaspoon of turmeric powder and make a paste from these ingredients. You should dip a cotton ball in this paste and then you should put the cotton ball in your mouth on the affected area. Also you can apply it directly. Also you can mix turmeric with raw and organic honey which also has powerful antibacterial properties. You can add honey for his properties but also for his taste. Thyme: There are many studies in which is shown that thyme has strongest antimicrobial properties of all essential oils. Also thyme has medicinal, antiseptic and antifungal properties which can make it very effective for pain relief. Also these properties will keep you safe from tooth decay and gum disease. There are many different ways in which thyme can be used as natural treatment for toothache. You can make a thyme tea. You should swirl this type of tea in your mouth and holding it for thirty seconds before swallowing. Also there is another way in which you can use thyme as your natural treatment and it is considered as the best natural treatment for toothache. That is to chew the thyme leaves. When you have a toothache, then you should chew the thyme leaves on the opposite side and not on the side where your tooth is affected because in this way you can worsen the condition. This will happen if the thyme leaves get into the affected tooth. When you chew the thyme leaves, then this helps you to bring out its juices. This will help you to reduce the pain and it will help you to heal bleeding gums. Also there is another option which you can make from the thyme. You should dilute a few drops of thyme essential oil with carrier oil like olive oil and then you should gargle with this natural cure. Also you can apply this oil directly on the affected area. You should use a minimal amount. This means you should use one drop or less. This will help you to soothe the toothache and it will fight against infection.